This architectural rendering shows an aerial view of the Pinnacle Heights new urbanism community in Rogers. It's situated at the northwest corner of the Pauline Whitaker Parkway roundabout, south of Hunt Tower. The first phase of a $100 million “new urbanism” community in the Pinnacle Hills area west of Interstate 49 in Rogers is underway. 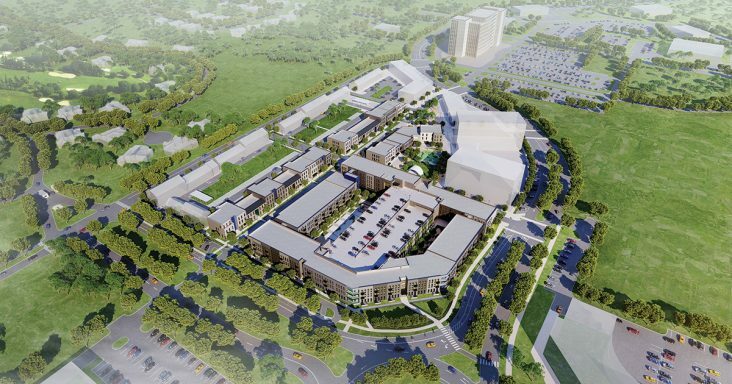 Crossland Construction recently paid the city of Rogers for 10 building permits valued at a combined $49.6 million to begin work on Pinnacle Heights, a 15-acre mixed-use development that will emphasize walkability and placemaking. The project at 3941 S. Champions Drive, first announced in the summer of 2017, is a joint venture between Cushman & Wakefield/Sage Partners, Hunt Ventures of Rogers and Urban5 Partners of Oklahoma. The first phase includes the construction of 295 multifamily units including 12 live-work units, 30,500 square feet of retail space, a boutique hotel and numerous restaurants. Phase I is expected to be complete in the third quarter of 2021. Phase I will also include a 400-space wrapped parking structure that will allow for greater walkability throughout the community, as opposed to the sprawling parking lots of most suburban developments. The 12 live-work units will be unique to the market, according to the developers, with units ranging from 1,300 to 1,500 square feet, combining a 650-square-foot showroom at the front and an efficiency apartment in the back. “We believe these units will appeal to a number of artistic types and vendors needing a place to showcase their product,” said David Burnett, developer for Urban5 Partners. The retail space is designed to attract local retail shops and restaurant tenants. “The goal is not national chains typical of the area but rather to target a local coffee shop, small neighborhood bakery, eclectic bookstore and other tenants that foster a sense of community,” Burnett said. Pinnacle Heights will be built in accordance with national green building standards, with more than 300 trees planted throughout the community. The trees will be of four indigenous species to ensure growth and longevity, according to the developers. CBRE Group Inc., through its capital markets’ debt & structured finance team, arranged $44 million in construction in permanent financing for the development. The loan for the project is funded through the U.S. Department of Housing and Urban Development’s (HUD) Section 221(d)(4) new construction mortgage insurance program, providing an interest-only construction period of 19 months with a 40-year, non-recourse, and fully amortizing permanent loan. Chris Dunning of CBRE’s Oklahoma City office and Chad Ricks of CBRE’s Dallas office originated the loan through CBRE’s FHA lending platform on behalf of the sponsor, Pinnacle Urban Partners LLC. Gardner Architects of Oklahoma City is the project architect. PATH Engineering, Design & Urbanism in Edmond, Okla., and Crafton Tull in Rogers are handling the civil engineering work. The land is owned by J.B. Hunt Transport Services Inc. co-founder and philanthropist Johnelle Hunt, chairman of Hunt Ventures. Pinnacle Heights’ development plan also calls for an on-site music venue. It should also complement existing development and area amenities in Pinnacle Hills, with proximity to the Walmart Arkansas Music Pavilion (AMP) and the planned Topgolf that’s expected to break ground this spring south of the AMP. Additionally, residents will have access to Razorback Greenway bike trail, bike sharing programs and an equipment servicing station.